March | 2015 | Does This Font Make Me Look Fat? 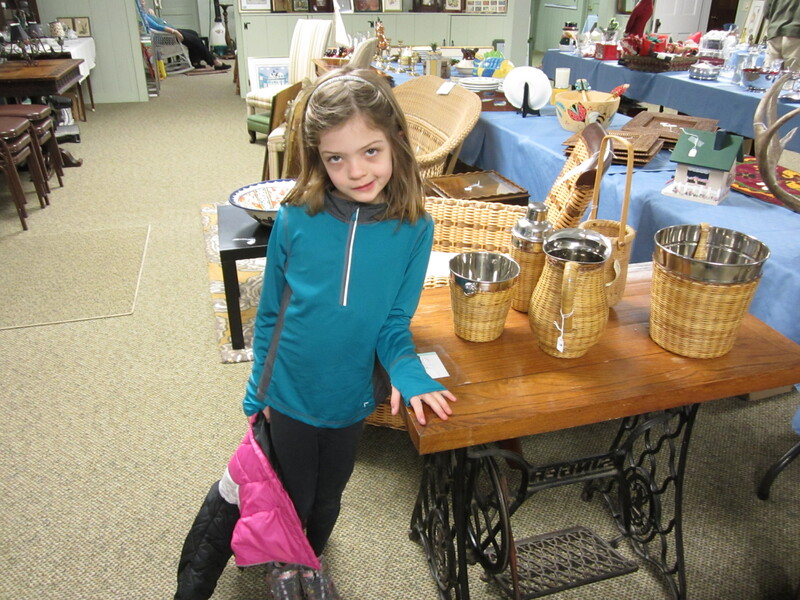 Last Friday this little girl came into the Woman’s Club of St. Michaels’ Consignment Capers event that I co-chaired. She walked around several times and then honed in on this treadle sewing machine base with an oak top. $45. This kid knows a bargain. I doubt she was eight years old. Her mother told me that the little girl had graduated from cartoons and her favorite TV show was Flea Market Flip. This was early on the first morning of the sale. We don’t negotiate prices first thing, and this precocious child really wanted to negotiate. But no deal. If we won’t negotiate with the dealers we can’t change the rules just because somebody is so darn cute. I think the photo says it all. She really, really wanted the fun of the deal and was a little ticked. We heard her mother talking to her about how sometimes if there’s something you love, you just have to get it because it might not be there later. So mother handed over the cash and one of our first customers went home happy. We have no idea what she’s planning to do with it. I hope she won’t paint it pink and put glitter all over it, but it’s hers now. The next morning the father and daughter came to pick up the table and it turns out they are new neighbors. They are down the road and around the corner so I might not have met them if they hadn’t come to Consignment Capers. All of us who write have other commitments in our lives. Finding time to write is a pressing problem for those of us who have full time jobs, and families. I consider my volunteering a full-time job. This is what I will be in charge of this week. 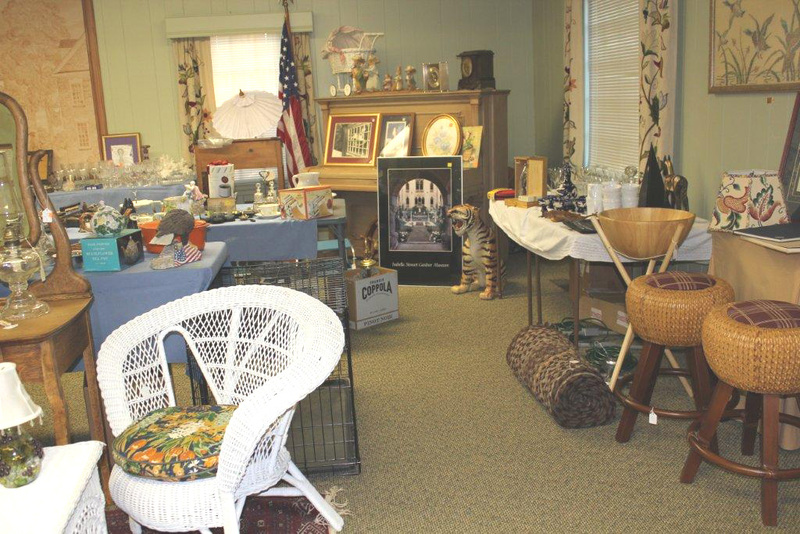 Consignment Capers is a St. Michaels Woman’s Club fund-raiser that funds our annual 6K scholarship to a St. Michaels High School Senior and other civic outreach programs. We like to think it’s several notches above a flea market. Pictured above are just some of last year’s sale items. People bring their unused things and the club sells them at a two day event. 50% to the consignee and 50% to the club. It’s a win-win. De-clutter your house, get some money and help send a kid to college, fund the local food bank, etc. My co-chair says it’s like waiting for D-Day. Perhaps a little perspective is needed. I am a full-time retired person. Retired doesn’t mean I don’t work; it means I don’t get a pay check. I seem to be busier than ever, but on the plus side I have the luxury of being able to schedule my time. Volunteer activities intrude on writing, however, often as much as a paying job. Like most writers, Laura and I have to shoehorn writing into our busy lives. Lunch times when Laura can get an hour or two away from the office and weekends if her husband is flying. My schedule is more flexible. The planning of this Consignment event has taken up a lot of my time for the past month. Laura is busy with her business, but we are on to a new project – turning our scripts into e-Scripts and putting them up on Kindle. The idea is that you can read a script almost like a book, and in a lot less time. The reader can visualize her own movie. Laura is having way too much fun designing covers and I’m turning the scripts into epub files on Calibre. A new skill set for me. We have a total of seven scripts and one play that we can put on Kindle. We might as well get them out there since no studios are knocking on the door – yet! After Consignment Capers is over, shoehorning in time to write will continue as Spring is on the way and soon I’ll be back in the garden. If you’re a script writer, have you considered putting your scripts on Amazon’s Kindle? We’d love to know about your experience. The weather goddesses smiled on the Bay to Ocean Writers Conference once again on February 28th. It was cold but clear, and the snow held off until the next day. We had one minor hiccup when a speaker called me at 7:30 a.m. to say she had woken up with conjunctivitis and needed to go the the doctor. She had a 10:30 presentation slot, and was an hour away. But she kept in touch by phone and managed to get to the conference with time to spare. 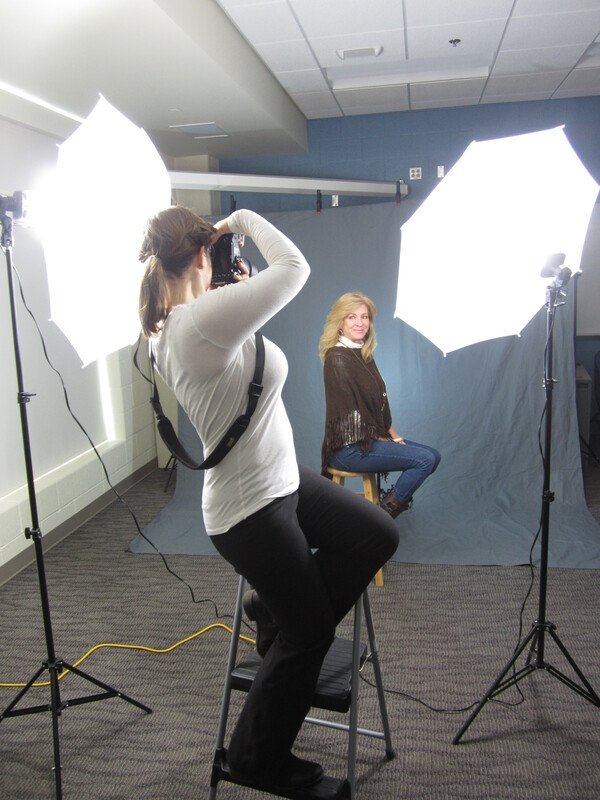 That speaker had also signed up for a head shot session with Jennifer Madino of Jennifer Dawn Photography. Laura took advantage of this opportunity as did I. I’ll publish our photos when we get them. I did put mascara on, but as I had to be at the conference site at 6 a.m. the photos will show if it ended up where I intended. The speaker with conjunctivitis was concerned about her red eye, but Jenny said she could fix it with PhotoShop. Need whiter teeth, under eye bags, crows feet, or wattle removed? Jenny’s healing brush is at the ready. BTO is organized by an all volunteer committee and we work all year for this one day. Our time and energy is our gift to writers and their enthusiasm and appreciation as they leave the conference is our pay. We’ll take a short break and begin planning Bay to Ocean 2016 on April 4th. Could I Face the World Without Mascara? I just looked Googled the question “who invented mascara?” Early Egyptian versions included crocodile dung. Why am I not surprised! Later versions were mixtures of petroleum jelly and coal. 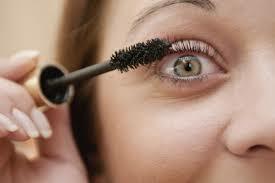 The mascara wand was not developed until almost 1960. Don’t get me wrong, I really like the way I look when I add mascara to my make-up routine. Note: my make-up routine is not very exciting. Some moisterizer and then a little bit of Bare Minerals powder. If I’m going out into public I might add some eyeliner. But if I’m going out to dine, or know I’m going to be photographed, or attending a meeting with other “women of a certain age” I go the additional mile and add mascara. After all, we need to pretend to one another that we are still in our 30’s. The problem is that I’m right handed and when I put mascara on my left eye I usually manage to poke myself in the eye with the wand. I’ve always wondered they call it that. Wand, as in magic wand? Will it magically make us 20 again? Do I really want to look like those women in the ads who seem to have grown pelts on their upper lids? Disclaimer: photo below is not me. When I was twenty you could still see my blonde eyelashes. They were kind of golden. They’re still there, but seem to have receeded into invisibility only corrected by the dreaded wand. The indignity of poking myself in the eye always results in a reflex action of my hand that means I have now smeared mascara below my eye. That section where I had carefully applied concealer. Crap! Now I have to start again on that left eye and hope I can make it look like the right eye. 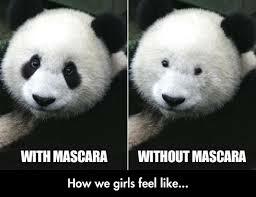 You can understand why most days I don’t even pick up mascara. If I’m writing at my computer, or out in the garden, who’s going to see me? My husband will, of course, but he tells me he likes me with or without make-up and I’m inclined to take him at his word. And I didn’t even get to the part about removing mascara before going to bed. That’s another travail. I’m beginning to wonder why I ever bother. 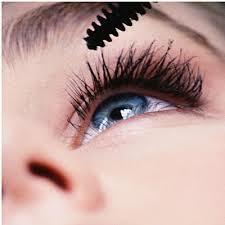 Could I face the world without mascara? What about you?